Make your move to your new home less stressful by letting the professionals at Troy's Moving & Storage help you. 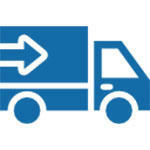 We can wrap your fragile and valuable possessions and transport them with great care. Call us for more details.